After my first session back at Ludus in quite some time yesterday I was more “wrecked” than normal, which is to be expected. However I still had a 45 minute run session to complete. The fact that I decided I would run from home which involves hills whichever way I turn – long hills – correction long steep hills. But I got changed (yay), avoided any kidlets seeing me (if you have kidlets you will understand how hard it is to get out of the door once they spy you) and hit the road. 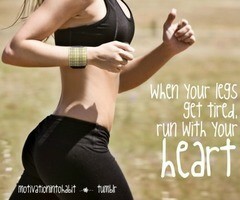 Lucky I’ve got a big heart because my legs have absolutely no stamina yet! Right as promised I am FINALLY getting around to answering some of your questions .. I guess Tuesday is a good a day as any ..
Unsurprisingly most of them seem to be curious about my new endeavor to be a half an iron person. Since I am only just starting out on this journey some of the questions are in the “I have no idea is there a multi choice answer?” pile and I will come back to those as I can. This is actually harder to answer than you realise because I don’t like any of them so far so I guess I would have to pick my least hated one which is still pretty hard. I probably would have said cycling without any hesitation until I fell off my bike in the weekend (and then had to run with blood pouriing down my leg cause it was a brick session) But even then at a pinch it would still be cycling. But since Im only in my third week of training to become a half an iron person this may change, I will keep you up to date. It’s time to get a shuffle on, its nearly lunchtime and today it’s gonna take me some time to hobble across the office to the kitchen ..
Hmm i want to know now how many calories a day you are on? !